Magical & Mystical (Harry Potter) NEW! Let your imagination run wild! From hippogriffs, dragons, house elves, basilisk, and owls, to sorting hats, dementors, potions, spells…and all things magical, come join us for the time of your life! Search for Horcruxes throughout the week, team up for our Harry Potter Trivia Game, design a broom, and play the wizarding sport of Quidditch. Paint Hogwarts castle, sculpt Dobby or Kreacher house elf, draw mythical creatures, make a Marauder’s map, brew up Butter Beer, create your own wand and Death Eater’s mask, Patronus, chocolate frogs, and lots, lots more! 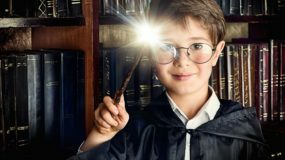 Bring your favorite HP book(s) to camp to freshen up on spells, characters, and discuss analogies to the muggle world today. So much magic to do! Camps start at $285.00 per week. To see what a typical day is like, click here. Please see our 2018 Camper Welcome Packet or more information. Please see our camp descriptions for more information. For camper grades P-K we also offer a half-day program. The hours are from 9-1pm and the cost is $235 per week. Post Camp services are not available for the half-day program. Your camper will need a snack, lunch, and drinks. After June 1st registrations can be moved to another week or location. Or, you can receive a 100% credit for the following camp season. How do we stay on top of it all without going crazy!? The easiest solution, we believe, is to send all of your kids to every single week of Club SciKidz Summer Camp. With 52 unique camps, we have something for all of your kids! Learn more about opening a Club SciKidz franchise. Submit your information to get access to our brochure and detailed franchise information.